“What is it about the story of ‘The First Thanksgiving’ that makes it essential to be taught in virtually every grade from preschool through high school?” begins the post “Deconstructing the Myths of ‘The First Thanksgiving’ “ by Judy Dow (Abenaki). This article includes 11 myths about the first Thanksgiving, notes and sources, recommended books about Thanksgiving, and primary sources from a colonialist perspective. Find this post and more under Resources at http://oyate.org. Giving Thanks, A Native American Good Morning Message by Chief Jake Swamp is a wonderful book that reminds us about the importance of being grateful for all that Mother Earth has provided for us. “Repeat after us, say no to the mission project.” from California History-Social Science Project at UC Davis; http://chssp.ucdavis.edu/blog/mission#. “Dear Sierra: An Open Letter To California Fourth Graders” (http://badndns.blogspot.com) and “Balancing ‘Gruesome details’ and 4th Grade Standards” (http://whenturtlesfly.blogspot.com) by Professor Deborah A. Miranda. Many 4th grade teachers use Island of the Blue Dolphins by Scott O’Dell as a class literature study during the Native American unit of study. As a follow up, consider reading Dear Miss Karana by Eric Elliott. This engaging story is told by a ten year old Native American girl living on a reservation and attending a reservation school in Southern California. The story links the the life of Karana, the lone woman, and the native world today. This story is a rich resource of native culture and language and connects the past with the present. 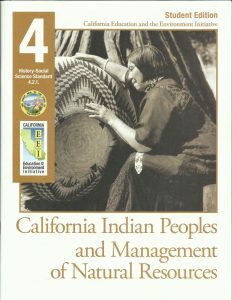 The EEI Curriculum Catalog is a useful resource that includes materials for teaching the third and fourth grade California Native American unit of study. The California Education and the Environment Initiative (EEI) is a free K-12 curriculum that teaches critical skills in science and history-social science using environmental topics, such as water and energy, as a lens. The EEI Curriculum makes learning relevant and fun for students by engaging them in topics they care about – the air they breathe, the water they drink, and the food they eat. All content is California State Board of Education-approved and helps support Common Core and Next Generation Science Standards. Use the free EEI Curriculum to build your students’ understanding of their relationship to the environment and prepare them to be critical thinkers and 21st century problem solvers. The California Education and the Environment Initiative (EEI) is part of statewide effort to ensure all California K- 12 students are environmentally literate and can help shape a prosperous and sustainable world. The EEI was signed into law in 2003 and mandated the creation of a standards-based curriculum to bring education about the environment into California’s K-12 schools. The EEI Curriculum consists of 85 state-adopted and approved science and history-social science units that complement existing instructional materials, allowing teachers to substitute EEI lessons for portions of their current textbooks.